Krochet Kids started with hats to empower women out of poverty, but has since grown to include full collections of clothing and accessories for men, women, and children with locations in peru and uganda. Kohl Crecelius, a co-founder of Krocket Kids, was at Yellow Conference. Yup, a dude in a sea of 500 women. And it was POWERFUL! I’ve known about Krochet Kids for years. Long before they were cool. Back when they literally just selling crocheted HATS. My roommate at the time, Mallory, knew them, and shared their vision for supporting women and children one night. I distinctly remember nodding my head and thinking “That’s cool. They are making a difference.” It was my first brush with the idea of cause-based consumerism and ethical fashion. Krochet Kids started with simple crocheted hats, but is now a successful non-profit social capitalism brand that empowers people to rise above poverty by giving them jobs creating apparel, knit, and...those crochet hats. Those hats are changing the world one life at a time. The women who make the hats (and now all the other products) hand sign each piece, and the Krochet Kids website tells more about each woman's story. Kohl emphasized that if he could take crocheting… something so simple and “reserved for old ladies” and use it to champion empowerment and changing the world, then we all have something we can use to change the world. I couldn’t agree more. But we all have even more than our talents and dreams. We have our daily choices, which carry their own potential for impact and change. When I heard Kohl speak today it simply stoked the fire inside my soul for the power of ONE. One person’s life changed at a time. That that even one person is worth fighting for. The truth that one choice at a time can make a difference. That’s the heartbeat behind SHE Changes Everything, which exists to make ONE sustainable, healthy, ethical choice at a time feel simple and to celebrate their impact. We celebrate each SHE choice, but it is not possible to get it “right” every time. And that’s ok…without being an excuse not to try. I just had a conversation on Instagram with someone who admitted to buying their flowery, summery shirt from Walmart. Not a beacon of ethical choices. But I applauded her honestly. Ladies, when you enter ethical fashion or healthy eating or become a spokesperson for “the better,” it is almost impossible to crawl out from under the crush of “always” and perfection. But we must. 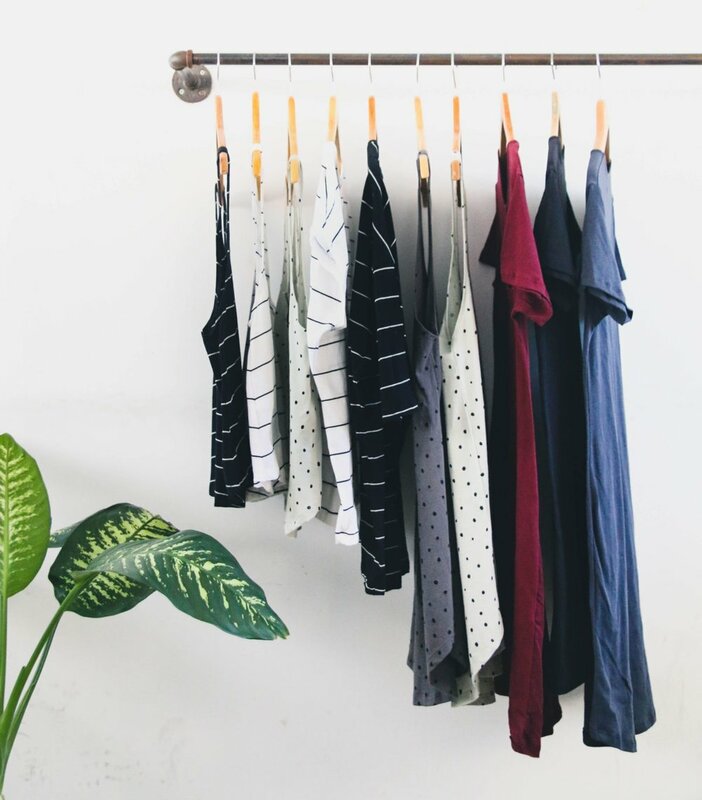 It makes us slink and feel shame and guilt when we choose the pizza, or drink out of a plastic straw at a coffee shop during Plastic Free July (true story), or buy the non-ethical shirt from Wal-Mart. And it is a dark and dangerously unhealthy place. Raise your hand if you've felt the burden of perfectionism on your shoulders. There should always be the drive to do more and choose better within each situation, but without the fear and shame. It's exhausting and will crush our desire to make changes. Feel the difference? The lightness of pressing into the “get to” and the “want to?” The possibility of taking it one moment at a time? It takes us off of auto pilot. And that happened during Kohl’s talk. He cried on stage. I know I’m outing him, but when he did he shocked a room full of women into awareness for a moment, which is a glorious thing in our overstimulated-to-the-point-of being checked-out daily existence. When something is different than expected, your brain starts paying attention. We crash into consciousness from our daze of predictability and habit. Some would say a guy crying isn’t “perfect,” it is not that strong masculinity we’ve all been conditioned to expect. But buying fast fashion clothes every few weeks or thoughtlessly grabbing food without ever thinking of who grew it and made it is how we’ve been conditioned to think as well. A lot of how we've been conditioned should change. It's mindless. Autopilot. Unquestioned and dangerous. I can’t think of a better time to eye up the way “it’s always been” to press into a new stage of awareness and intentionality - one choice at a time. Consciousness, not perfection, is the attitude that will contribute the most to our world. Living each choice and owning that moment! Krochet Kids launched a line or organic clothes in early 2017. it simply made us even bigger fans! Organic clothes are ultimately better for you, the workers, and the environement.